Hi everyone and welcome to my review of Covert Commissions,don’t worry this product will not require you to go undercover and steal some affiliate marketing secrets. Covert Commissions is a done for you affiliate marketing system that was first released back in 2015. Since then it has gone through some major upgrades and has become a very popular product on the JVZOO network. Now,just because something is popular does not make it a good product,so the question is,does Covert Commissions live up to its claim? Will it help you to make affiliate commissions? Well, that is what we will find out in my review. Before I get on with this review of Covert Commissions,I should say that I am an affiliate of this product. Any links in this article will most likely be an affiliate link and I will get a small commission if you should purchase Covert Commissions through any one of those links.There are not many products that I promote on my blog unless they are very good and Covert Commissions is a very good product. Covert Commissions has been around a few years and most of the reviews you read are from the time it was first launched and do not reflect the major changes and upgrades it has gone through. I personally think it is one of the best done for you systems that I have come across and the best I have reviewed on my site. Covert Commissions is one of the best done for you systems I have reviewed,if you are new to affiliate marketing,Covert Commissions will help you launch affiliate campaigns with ease. After your initial set up,you literally just have to send traffic to your chosen offers and they take care of the rest. Click on the button below and see for yourself yourself. Covert Commissons is all about building an email list and then monetising that list through affiliate marketing. Email marketing is an effective way to start an affiliate marketing business,however,it can be time consuming because there is a lot going on behind every successful email marketing campaign. Have you ever tried making money through JVZOO, Clickbank or Warrior+ but failed because you just didn’t have the knowledge to set up a successful affiliate marketing campaign? This where Covert Commissions comes in because everything is already set up for you. 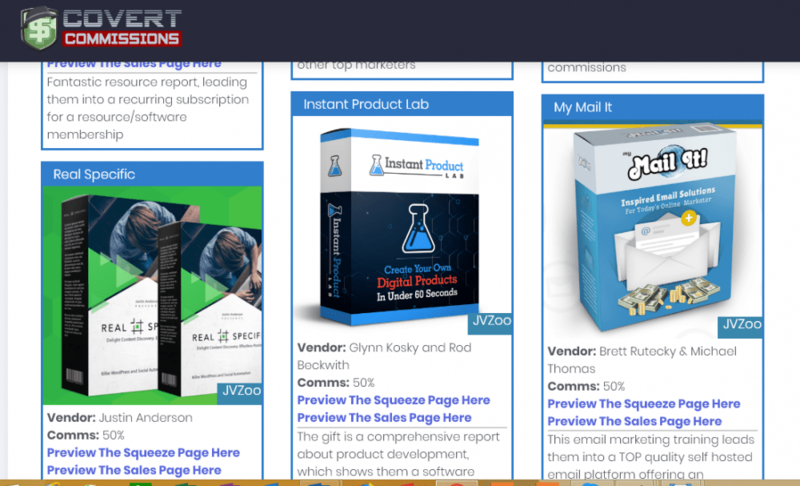 Each campaign includes a high converting squeeze page that you will use to give away a high-value report or software. Once someone opts into your squeeze page they will be taken through a thank you page, a confirmation page and a download page. It doesn’t stop there though,Covert Commissions continues to work for you ,after your leads have received their report or software,they will also receive follow up emails promoting a niche relevant product from one of the four affiliate networks mentioned above. Your leads will continually receive emails promoting various other products and they will always be hard coded with your affiliate links. So, basically what will be happening is that Covert Commissions will continuously promote products on your behalf for as long as you are a customer of theirs. The member’s area is well designed and easy to navigate,you can see that Cindy Donovan has put in a lot of work to make this system work on every level. I have seen other DFY systems that are badly designed and the user experience leaves a lot to be desired. However,Covert Commissions members area is very well designed and looks very professional. Cindy Donovan says that this her core product (she has a lot of good products,check them out on her website,wildfireconcepts.com),but Covert Commissions was her first major project and she continues to improve it year after year. Expanding on that video walkthrough,I would like to show you some of the offers that are available within Covert Commissions and the squeeze pages you would be using to get leads and commissions. All these products are evergreen and they have all been a top seller on their respective affiliate networks, so you know that with the right traffic ,they will convert. Below is an example of one of the landing pages you will have access to, this particular landing page is for a really popular cloud based autoresponder called MyMailit. The reports and software you will give away are all top quality and provide a lot of value and are not some cheap PLR they have put together. Inside of the member’s area, you will also have access to some traffic training which I found to be pretty good. They show you a variety of ways to get people to your squeeze pages, a couple of them were new to me,so that was helpful. In the dashboard section, you will be able to see all the missions (affiliate campaigns) you have access to,all the latest campaign that have been added and a calendar of all future launches. A new feature they recently added was developing a WordPress plugin for Covert Commissions,so if you have a WordPress website,it would be easy to integrate one of the missions into your site. Another feature they added was the ability to track all your campaigns so that you know which squeeze pages are converting and which are not and make necessary tweaks to your campaigns. There is one big difference between the cheapest monthly plan and the other two plans and that is with the cheapest option, you will not be able to export your leads whereas, with the other two, you can. This will allow you to build your own email list which you will be able to keep even if you decide to leave Covert Commissions. You can also purchase credits with which you can buy individual affiliate campaigns that are not included in your monthly subscription plan. Putting together an affiliate marketing campaign can be a little exhausting,especially for new affiliate marketers. Setting up squeeze pages,thank you pages,download pages all take time and for those starting out,it can seem to be a little too much work. This is why Covert Commissions is a real game changer for newbies,everything is done for you,all you have to do is send consistent targeted traffic. This is the best DFY system I have reviewed and the team behind the system continue to add to the system and improve it. If you are new to affiliate marketing and want a system that makes it easy to set up an affiliate marketing campaign,then I highly recommend Covert Commissions. Get Your DFY Affiliate Marketing System!! NextSix Figure Mentors Review- Is it a Scam? What I can say is that this product is very decent for the price. I have come across so many scams for A LOT of money but I can tell that convert commissions is genuinely good. The Price Point is one important factor for me and of course, it needs to be a legit program. One question that I have is how up-to-date is the program and software? We have to keep in mind that internet technology is evolving at an incredibly rapid pace and this investment could easily become useless tomorrow, if not maintained. Please let me know. Thank you! I agree there are a lot of scams that promise the world but deliver rubbish,however,Covert Commissions is definitely one of the better products out there and the founder has a very good reputation. This program has been out a few years not and it has been updated on a regular basis. If you have tried to make money through email marketing but haven’t succeeded,Covert Commissions may provide the solution. Thanks for the thorough review of Covert Commissions; it seems like a great system for those who would like a little assistance when starting out in affiliate marketing. I noticed that you gave it a rating of 85/100; how did you come up with this rating? What would have bumped it up to 100/100? Thanks for stopping by and commenting,yes this is a good program and can help new affiliate marketers in launching successful campaigns. I would never give any program 100, as I believe no system is perfect and could always improve,Covert Commissions could improve by having offers from more networks and having a couple of landing pages for each offer so that you can test them for better conversions. It is still a very good system as it is and hence why I recommend them. As it happens, I am currently writing a review on Covert Commissions. There is one big difference with your review in that I have never been a member in that program and I have based my article mostly on what their homepage has to offer and to some extent on a few reviews I studied. I am happy to read that you are quite positive on this system and I hope it does perform miracles for you. If it does, then please share and let me know what to do in order to achieve the same success. Thanks for your comment,I did mention at the beginning that the majority of the reviews about Covert Commissions are from when it was first released in 2015. I actually do not promote it heavily,I may do sometime down the line because I really do believe it is a very good system. I will be sure to update this article with my results. Thank you for this review on Covert Commissions. I had not heard of them before. I am still fairly new to affiliate marketing and although I have two websites, I still have not set up my landing pages, squeeze pages, thank you pages and special offer. the reason – It’s exactly what you said. All of these steps can be a little exhausting (daunting) for new people starting out. I can see how having a product like this would speed up my activity level and get me mailing out more offers more often. Thanks for sharing. Thank you kindly indeed for the detailed reviwe of covert systems done for you method of making money online, it is appreciated, thanks. Does covert commissions offer products that are not in the realm of makeing money online or the internet marketing market sector, to say do they have other niches? Thanks for your comment, actually they do but I think this is one area they could improve upon, they have few offers in the health and dating niche but it could definitely do with more offers outside of IM and MMO.